The Stephen Frost Improv All Stars are LtoR Andy Smart and Stephen Frost (back) and Steve Steen and Ian Coppinger (front). 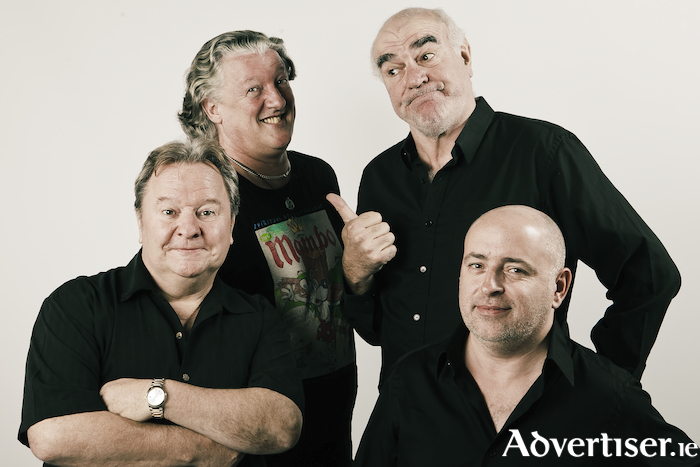 EVERY YEAR, Stephen Frost’s Improv All Stars - Stephen Frost, Steve Steen, Andy Smart, Ian Coppinger - play Vodafone Comedy Carnival and every year, and, as Hot Press has noted, "They get better than ever." Improv is where the performers arrive with no script and not the faintest idea of what will happen, creating sketches and comic dramas, from the tops of their heads, and our four heroes have impeccable comedy CVs. Stephen Frost has appeared in The Young Ones, Blackadder, Mr Bean [see the clip below], Whose Line Is It Anyway?, Have I Got News For You, and Never Mind The Buzzcocks. Steve Steen is also a Blackadder, Whose Line Is It Anyway?, and Have I Got News For You alumni, and has also featured on The Bill. Andy Smart has performed at 33 consecutive Edinburgh festivals including the all comedian version of 12 Angry Men, which also went on to tour Australia and New Zealand. Ian Coppinger was a founding member of The Comedy Improv (1992 ) where he still performs every Monday at the International Bar in Dublin. Amazing acts coming to the Royal Theatre - Jimmy Carr, Gavin James and much more!